The burial took place privately later the same day. Diana's former husband, sons, mother, siblings, a close friend, and a clergyman were present. Diana's body was clothed in a black long-sleeved dress designed by Catherine Walker, which she had chosen some weeks before. A set of rosary beads that she had received from Mother Teresa was placed in her hands. Mother Teresa had died the same week as Diana. Diana's grave is on an island (52°16′59″N 1°00′01″W﻿ / ﻿52.283082°N 1.000278°W) within the grounds of Althorp Park, the Spencer family home for centuries. Following her death, Diana left a £21 million estate, "netting £17 million after estate taxes", which were left in the hands of trustees, her mother, and her sister, Lady Sarah. 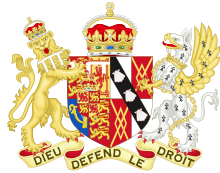 The will was signed in June 1993, but Diana had it modified in February 1996 to remove the name of her personal secretary from the list of trustees and have her sister Sarah replace him. Her two sons subsequently inherited the majority of her estate. Each of them received £10 million upon turning 30 years old in 2012 and 2014 respectively. Many of Diana's possessions were initially left in the care of her brother who put them on show in Althorp twice a year until they were returned to the princes. They were also put on display in American museums and as of 2011 raised two million dollars for charities. Among the objects were her dresses and suits along with numerous family paintings, jewels and two diamond tiaras. Diana's engagement ring was given to William, who later passed it to his wife, Catherine Middleton, while her wedding dress was given to Harry. Charles Edward Maurice Spencer, 9th Earl Spencer, (born 20 May 1964), styled Viscount Althorp between 1975 and 1992, is a British nobleman, peer, author, journalist, and broadcaster. He is the younger brother of Diana, Princess of Wales, which makes him the maternal uncle of Prince William, Duke of Cambridge, and Prince Harry, Duke of Sussex. Paul was the deputy head of security at the Hôtel Ritz at the time of the crash and had goaded the paparazzi waiting outside the hotel earlier. His inebriation may have been made worse by anti-depressants and traces of an anti-psychotic in his body. The investigation concluded that the photographers were not near the Mercedes when it crashed. After hearing evidence at the British inquest in 2008, a jury returned a verdict of "unlawful killing" by Paul and the paparazzi pursuing the car.Diana's death caused a substantial outpouring of worldwide grief, including numerous floral tributes, and her funeral was watched by an estimated 2 billion people. The Royal Family were criticised in the press for their reaction to Diana's death. Diana, Princess of Wales, was the first wife of Charles, Prince of Wales, and the mother of Prince William, Duke of Cambridge, and Prince Harry, Duke of Sussex. She owned a collection of jewels–both as a member of the British royal family and as a private individual. They were separate from the coronation and state regalia of the Crown Jewels. Most of her jewels were either presents from foreign royalty, on loan from Queen Elizabeth II, wedding presents, purchased by Diana herself, and heirlooms belonging to the Spencer family. Her jewellery was a mix of precious stones and costume pieces, often reported by the media as being "priceless", which the Princess found amusing. Most of the jewellery dates from the 19th and 20th centuries. At formal occasions, such as banquets, the Princess normally wore jewellery lent to her by the Queen, who owns more than 300 items of jewellery. Diana, Princess of Wales Hospital (previously Scartho Road Hospital) is a public hospital in Grimsby, Lincolnshire, England. It is managed by the Northern Lincolnshire and Goole Hospitals NHS Foundation Trust. The Diana, Princess of Wales Memorial Fountain is a memorial in London dedicated to Diana, Princess of Wales, who died in a car crash in 1997. It was designed to express Diana's spirit and love of children.The fountain is located in the southwest corner of Hyde Park, just south of the Serpentine lake and east of the Serpentine Gallery. Its cornerstone was laid in September 2003 and it was officially opened on 6 July 2004 by Queen Elizabeth II. Also present were Diana's younger brother Charles Spencer, her ex-husband Prince Charles, and her sons William and Harry. The opening ceremony brought the Windsors and the Spencers together for the first time in 7 years. The Diana, Princess of Wales Memorial Fund was an independent grant-giving foundation established in September 1997 after the death of Diana, Princess of Wales, to continue her humanitarian work in the United Kingdom and overseas. It was a registered charity under English law. The Fund closed at the end of 2012. The Diana, Princess of Wales Memorial Playground is a memorial to Diana, Princess of Wales in Kensington Gardens, in The Royal Borough of Kensington and Chelsea, London. It was erected after her death at a cost of £1.7 million on the site of the existing Peter Pan children's playground which had been founded in the time of JM Barrie (author of Peter Pan in Kensington Gardens), but it is larger and more elaborate than the original. The design, by Land Use Consultants, was inspired by Barrie's Peter Pan. Its most prominent feature is a full-scale wooden pirate ship which serves as a climbing area for children, and is surrounded by sand in which they can play. Other features include slides, swings, and an area designed for those with disabilities, including fragrant plants and sound features (for those with visual disabilities). The playground is an example of a "natural play" concept, designed to stimulate children's imagination, sense of adventure, and to encourage them to challenge their physical and mental powers. It is at the north western corner of Kensington Gardens, in sight of the Princess's former residence at Kensington Palace. It is adjacent to the Broad Walk of Kensington Gardens. The Diana, Princess of Wales Memorial Walk is a 7-mile (11 km) long circular walking trail in central London, England, dedicated to the memory of Diana, Princess of Wales. The Diana, Princess of Wales Tribute Concert was a British music concert held in memory of Diana, Princess of Wales on 27 June 1998, a few days before the date of what would have been her 37th birthday. The concert was held at Althorp Park, the Northamptonshire seat of the Spencer family, and Diana's childhood home. Artists and groups who performed at the concert were among those enjoyed by the late Princess, and included Cliff Richard, Chris de Burgh, David Hasselhoff, Duran Duran, Jimmy Ruffin and Lesley Garrett. The concert was attended by 15,000 people, with proceeds from ticket sales being donated to the Diana, Princess of Wales Memorial Fund, but the £39.50 price attracted criticism due to its perceived expense. Phil Collins, who did not appear at the concert, was among those to comment on the amount charged to concertgoers. Highlights of the concert were broadcast on BBC One on the evening of 1 July.The idea of holding a concert at the Althorp estate was conceived by Earl Spencer, and details were first revealed in January 1998, shortly after it had been announced that Althorp would be opened to the public for the first time. The concert would feature a lineup of artists and groups from the worlds of classical music, pop and rock, all genres liked by the late Princess. The lineup was announced on 27 February, with tickets going on sale the following day. Two thirds of the tickets had sold out by the end of February, but BBC News reported they had not sold out as quickly as anticipated, prompting Collins to highlight what he believed to be their high cost in a radio interview.Althorp Park was opened to the public a few days after the concert, with an entrance fee of £9.00. Visitors were invited to view an exhibition of the Princess's life and works. This remained open until 30 August, the day before the first anniversary of her death. The Diana, Princess of Wales Memorial Award was established in 1999 by a board chaired by the then Chancellor, Gordon Brown, who felt that the award would reflect the personal interest of Diana, Princess of Wales in supporting the outstanding achievements of young people.The Diana Award is now a UK-based charity, operating across the United Kingdom and beyond. The organisation is a charity legacy to Diana, Princess of Wales' belief that young people have the power to change the world. Its programmes cover Mentoring, Anti-Bullying and its namesake, the Diana Award. Emad El-Din Mohamed Abdel Mena'em Fayed (; Egyptian Arabic: عماد الدين محمد عبد المنعم الفايد‎ [ʕeˈmæːd ɪdˈdiːn mæˈħæmmæd ʕæbdelˈmenʕem fæːjed], 15 April 1955 – 31 August 1997), better known as Dodi Fayed (Egyptian Arabic: دودي الفايد‎ [ˈduːdi]), was the son of Egyptian billionaire Mohamed El Fayed. He died in a car crash in Paris with Diana, Princess of Wales on 31 August 1997. He was also a first cousin to Jamal Khashoggi through his mother, who was a Saudi journalist killed in Turkey in 2018. The public funeral of Diana, Princess of Wales started on 6 September 1997 at 9:08am in London, when the tenor bell sounded to signal the departure of the cortège from Kensington Palace. The coffin was carried from the palace on a gun carriage, along Hyde Park to St. James's Palace, where Diana's body had remained for five days before being taken to Kensington Palace. The Union Flag on top of the palace was lowered to half mast. The official ceremony was held at Westminster Abbey in London and finished at the resting place in Althorp.Two thousand people attended the ceremony in Westminster Abbey while the British television audience peaked at 32.10 million, one of the United Kingdom's highest viewing figures ever. An estimated 2.5 billion people watched the event worldwide, making it one of the biggest televised events in history. Cynthia Jane Fellowes, Baroness Fellowes (née Spencer; born 11 February 1957) is one of the two older sisters of Diana, Princess of Wales, the other being Lady Sarah McCorquodale. The Princess of Wales Theatre is a 2,000-seat live theatre in Toronto, Ontario, Canada. It is located on King Street West, in Toronto's downtown Entertainment District. The theatre's name has a triple meaning: it honours Diana, Princess of Wales, with whose consent the theatre was named; it links the building to its sister theatre, the Royal Alexandra, one block to the east, also named - with Royal assent - for a former Princess of Wales; and it recalls the Princess Theatre, Toronto's first "first-class legitimate" playhouse, that stood three blocks to the east until 1931. The wedding of Prince Charles and Lady Diana Spencer took place on Wednesday 29 July 1981 at St Paul's Cathedral in London, United Kingdom. The groom was the heir to the British throne, and the bride was a member of the Spencer family. The ceremony was a traditional Church of England wedding service. The Dean of St Paul's Cathedral Alan Webster presided at the service, and the Archbishop of Canterbury Robert Runcie conducted the marriage. Notable figures in attendance included many members of other royal families, republican heads of state, and members of the bride's and groom's families. After the ceremony, the couple made the traditional appearance on the balcony of Buckingham Palace. The United Kingdom had a national holiday on that day to mark the wedding. The ceremony featured many ceremonial aspects, including use of the state carriages and roles for the Foot Guards and Household Cavalry. Their marriage was widely billed as a "fairytale wedding" and the "wedding of the century". It was watched by an estimated global TV audience of 750 million people. Events were held around the Commonwealth to mark the wedding. Many street parties were held throughout the United Kingdom to celebrate the occasion. The couple separated in 1992 and divorced in 1996 after fifteen years of marriage.